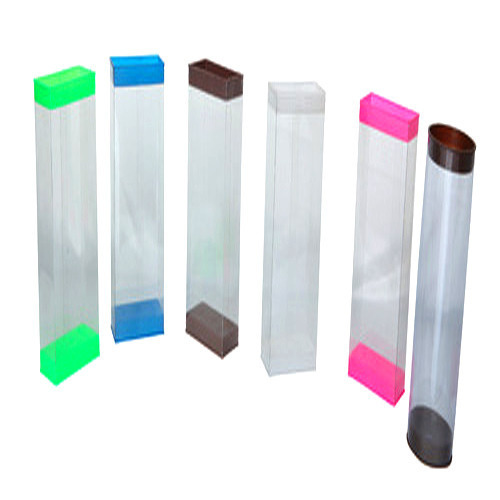 We bring Transparent Rigid PVC Long Boxes which are used for storing long items without damage. We have designed them to make it easy to handle any kind of items with all sort of equipments. These boxes are fabricated according to the prerequisites of clients. These boxes are durable and lightweight at affordable prices for out clients worldwide. Our designers has designed the bags using the innovative techniques so that they are easy to carry. PVC India, established in 1978 is foremost organization engaged in manufacturing and trading of PVC bags, packaging boxes, PVC packaging boxes, product packaging boxes, poly printed bags, zipper vinyl bags, pp bags, PVC shrink films, polyester sheets and transparent PVC boxes and many more. We fabricate these products using the reliable and consistent raw materials. To fabricate the products we uses the high technology. We are based at Sadar Bazar (New Delhi) in a sound infrastructure. We uses such innovative techniques which produce less pollution. These products are applicable in various industries across the globe. These products are very durable, flexible and easy to use with low maintenance and light weight. We have experts who are experienced and talented. The cooperation of experts helps us to achieve a renowned position in the international markets. They apply such innovative techniques which are very effective to produce the durable and light weight products. The job of quality controller is to check the unique quality of the products. We cater to the clients which are located across the globe. We aim to achieve the maximum client satisfaction by providing them unique quality. To fulfill the clients prerequisite, each member of our organization work efficiently. Since our establishment we are offering the qualitative products along with the competitive price structure.